PORT-AU-PRINCE, Haiti, Dec. 15, 2006 (Reuters) -- Kidnappers freed seven children snatched two days ago from a school bus in the Haitian capital, but several other children were abducted in the latest wave of kidnappings-for-ransom, police said Friday. "The children were released on Thursday night. ... They are fine," said Henri Dossous, police commissioner in charge of the anti-kidnapping unit. "The ransom collected by the families was paid to the kidnappers." No arrests were made in the case, and police would not reveal the amount of the ransom paid. As many as seven other children were kidnapped in separate incidents Thursday, according to witnesses and local media. Police confirmed that several children had been abducted. In a new twist to the rash of kidnappings that have plagued the impoverished Caribbean nation in recent weeks, children were being targeted because they offered no resistance and their families were more likely to pay quickly, police said. The abduction of children appeared to have struck a nerve with Haitians. Residents of the capital helped police in door-to-door searches for the kidnap victims this week, and authorities reported a sharp rise in calls from the public with information on the case. About 100 kidnappings for ransom were reported last month, and at least 60 have occurred so far this month, including that of a 6-year-old boy who was killed. The kidnappings are still more bad news for Haiti nearly three years after then-President Jean-Bertrand Aristide was driven into exile by a violent rebellion. U.N. peacekeepers have done little to reduce violence since they arrived in June 2004, although Haiti enjoyed a brief period of relative peace after President Rene Preval won elections in February. 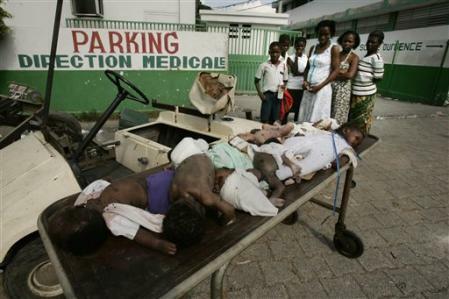 PORT-AU-PRINCE, Haiti, Dec. 14, 2006 - Striking workers removed the corpses of 11 infants from the morgue of Haiti's largest public hospital and laid them out in a courtyard Thursday in a macabre protest aimed at pressuring the government for back wages. The workers placed the bodies on a table in view of several schoolchildren at the General Hospital's compound in downtown Port-au-Prince. The striking employees, mostly janitors and morgue workers, also blocked the main entrance to the hospital and prevented anyone from entering. "We're calling on the government to solve the problems here at the hospital," said Jean Pascal, a janitor. "Until then we must show the people what needs to be done here." Pascal said the workers had not been paid in six months. Doctors and nurses were also on strike but did not participate in the protest. Haiti's Ministry of Health offered no immediate comment on the two-week strike. It has crippled operations at the hospital, which serves Port-au-Prince's densely populated downtown. The usually bustling emergency room was nearly empty Thursday except for two prisoners who were dropped off by police and chained to their beds. One man had a gunshot wound to the leg and the other a machete wound, hospital workers said. Haiti's cash-strapped government, still reeling from a 2004 rebellion that toppled former President Jean-Bertrand Aristide, has struggled to pay thousands of public employees, many of whom have gone months without a salary. PORT-AU-PRINCE, Haiti, Dec. 14, 2006 - Gunmen abducted 10 children after hijacking a school bus and another car Wednesday in brazen daylight assaults, according to local media reports. Haitian police spokesman Frantz Lerebours confirmed that several students were kidnapped, but said he did not know exactly how many had been taken. Police were searching for the captors, he said. Haitian broadcaster Radio Kiskeya reported at least six students were riding to school in a private bus when several armed men stopped the vehicle, forced their way aboard and ordered the driver to speed off to an unknown location. Around the same time, armed men stopped a red Isuzu Trooper carrying four children and two adults, Kiskeya said. The gunmen forced the adults out of the car and fled with the children. Both kidnappings happened in La Plaine, a northern suburb of Port-au-Prince that has become a base for armed gangs blamed for a wave of kidnappings. It was unclear if the two incidents were related. Kidnappings for ransom have become the top security threat in the impoverished Caribbean nation of 8 million, with children emerging as a new target. About 10 children have been reported snatched since November, including two who were killed by their captors. On Monday, two gunmen riding motorcycles pulled a 7-year-old girl from a car and shot her father several times after a struggle in Port-au-Prince's downtown district. The girl remained captive Wednesday and her father was in stable condition. Authorities blame the crimes on well-armed street gangs that flourished after a 2004 rebellion overthrew former president Jean-Bertrand Aristide. DECEMBER 12, 2006 - Lawmakers are debating a bill that would ban any form of association with a homosexual, even sharing a meal at a restaurant. The legislation would also prohibit belonging to gay clubs or reading books, watching films or visiting Internet sites that promote homosexuality, and proposes penalties of up to five years in prison. It is widely expected to pass. Engaging in homosexual acts is already illegal, with those convicted facing prison terms in the mainly Christian south and execution in the mainly Muslim north. Gays are so closeted and fearful there has been no public opposition to the legislation. Do immigrants, including Haitians, make us safer? PORT-AU-PRINCE, Dec. 3, 2006 (AFP) - Four Haitians were killed during voting in municipal elections, while UN peacekeepers fired tear gas to quell a disturbance at one polling station. The voting for mayors and local representatives showed a weak turnout amid a handful of disruptive incidents, mainly scuffles between Haitians and local authorities, according to reports and AFP reporters, but officials were pleased. "The voting went well generally," said Jacques Bernard, director of the election council. "Competition was very intense in the regions," he said. Among the four people killed by gunshots around the country was an off-duty police officer in the capital of the impoverished Caribbean nation. One person was killed when a polling station in northern Limonade came under fire by unknown assailants. The men first set fire to the polling place with a Molotov cocktail. One of them was wounded by a joint response of Haitian police and UN forces. In Port-au-Prince UN forces used tear gas to disperse a group of voters who occupied one polling center. On Saturday one candidate was wounded by gunfire from an opponent in the Artibonite district in the north. Election council president Max Mathurin blamed the incidents on "partisan zealots looking to sway the vote". Prime Minister Jacques Edouard Alexis voted in the capital Sunday morning while President Rene Preval, in Havana for Fidel Castro's 80th birthday celebrations, was to return during the day to vote in his home district Marmelade in the north. Some 29,000 candidates were vying for 1,420 positions in the vote, according to Bernard. More than 6,500 UN soldiers, 1,900 international police and 4,500 Haitian police officers provided security for some 3.5 million Haitians eligible to vote. The first results of the elections are not expected before December 9 and the final results not until the second week in January, Bernard told AFP. The elections will complete a series of polls that began last February, when Haitians elected Preval as president. That was a key step toward reestablishing regular governance after the resignation of president Jean Bertrand Aristide in early 2004 amid a popular uprising. After Aristide's departure to exile a force of over 8,000 UN soldiers and police went to Haiti to maintain order while an interim regime sought to re-establish stability. The elections are underwritten by funds from the United States, Canada and the European Union, along with UN support. WASHINGTON, Dec. 3, 2006 - Justice Stephen G. Breyer says the Supreme Court must promote the political rights of minorities and look beyond the Constitution's text when necessary to ensure that "no one gets too powerful." Breyer, a Clinton appointee who has brokered many of the high court's 5-4 rulings, spoke in a televised interview that aired one day before justices hear a key case on race in schools. He said judges must consider the practical impact of a decision to ensure democratic participation. "We're the boundary patrol," Breyer said, reiterating themes in his 2005 book that argue in favor of race preferences in university admissions because they would lead to diverse workplaces and leadership. "It's a Constitution that protects a democratic system, basic liberties, a rule of law, a degree of equality, a division of powers, state, federal, so that no one gets too powerful," said Breyer, who often votes with a four-member liberal bloc of justices. On Monday, the court will hear arguments in a pair of cases involving integration plans in K-12 schools. The legal challenge, which is backed by the Bush administration, could be among the most significant school cases since the landmark Brown v. Board of Education ruling in 1954 banned racial segregation. In 2003, the court upheld race-conscious admissions in higher education in a 5-4 opinion by Justice Sandra Day O'Connor. O'Connor, however, has since retired and been replaced by conservative Justice Samuel Alito. Justice Antonin Scalia, meanwhile, has denounced the use of race in school admissions as lacking any support in the Constitution. In his interview, Breyer argued that in some cases it wouldn't make sense to strictly follow the Constitution because phrases such as "freedom of speech" are vague. Judges must look at the real-world context â not focus solely on framers' intent, as Scalia has argued â because society is constantly evolving, he said. "Those words, 'the freedom of speech,' 'Congress shall pass no law abridging the freedom of speech' â neither they, the founders, nor those words tell you how to apply it to the Internet," Breyer said. Pointing to the example of campaign finance, Breyer also said the court was right in 2003 to uphold on a 5-4 vote the McCain-Feingold law that banned unlimited donations to political parties. Acknowledging that critics had a point in saying the law violates free speech, Breyer said the limits were constitutional because it would make the electoral process more fair and democratic to the little guy who isn't tied to special interests. "You don't want one person's speech, that $20 million giver, to drown out everybody else's. So if we want to give a chance to the people who have only $1 and not $20 million, maybe we have to do something to make that playing field a little more level in terms of money," he said. Breyer, who has voted to uphold abortion rights, declined to comment on the court's role in deciding abortion. Justices this term are considering the constitutionality of so-called "partial-birth" abortion in a case some conservatives hope will be used to overturn the landmark 1973 Roe v. Wade ruling. "The more the precedent has been around, the more people rely on it, the more secure it has to be," he said. Breyer commented on "Fox News Sunday," in an interview taped last week.